Whether it’s an industrial hi-tech video project, tourism or destination travel video production, or simply an explainer or a product video, camera motion adds a whole new “dimension” to the video story being told. You’ve heard the expression: “follow the action”. Camera movement, following the action, adds a sense of forward momentum, adds pace & energy, and allows the viewer to participate in the action. Re-watch your favorite movie, and analyze it to see how camera motion adds impact to key scenes. Or check out an interactive play, and see how much richer the experience compared to the traditional “glued to your seat” theatre production. There actually some solid science behind it. If you’re interested, check out this article on “mirror neurons” by the Scientific American. From a director’s perspective, camera movement is one of the most expressive tools available in video production. You would want to integrate effective camera moves because it has the potential to function in many different ways, such as to direct the viewer’s attention, help keep your audience engaged, and will also allow for more creative control over the atmosphere or feel of the video. Video camera motion adds aesthetic energy. For the videographer, there are two broad shooting options when adding camera motion: handheld or motion-stabilized. Handheld camera movement can actually add a lot of realism & grittiness to your project; it is very similar to the style used in indie documentaries, but can be jarring and tiresome over long periods for the audience. Motion-stabilized camera movement means you remove the vibration and jitters of hand-held, almost as if the camera is weightless. It is the preferred option for 99% of corporate video communications. 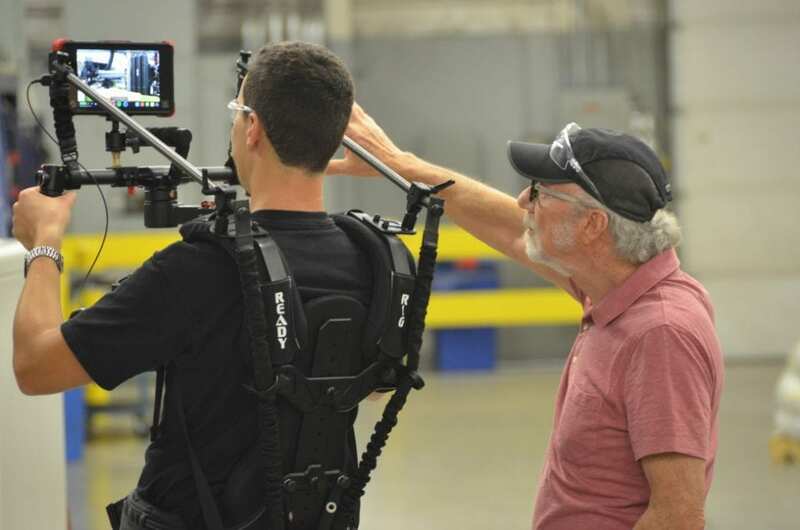 At On Point, we use a combination DJI Ronin 3-axis gimbal with a ReadyRig Gimbal Vest System. This allows our videographers to use this technology all day without tiring. Adding camera motion-stability used to be a very expensive production option, and limited to film or TV production budgets: massive cranes and tracked cars, and helicopters with gyro-stabilized camera systems. 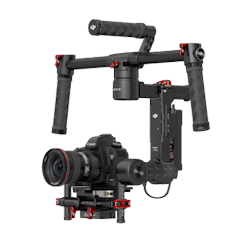 Today, there are a variety of affordable motion-stabilized technologies for corporate video production. We’ll cover two of our favorite camera-stabilization technologies in this blog post: Servo-driven gimbals and video drones. Servo-driven Gimbals (SDG) are used predominantly in our corporate video production whenever we are in “run and gun” mode. Yes, if we want to capture a scene from a still location, the gimbal can proxy as a tripod. However, for all types of motion – closeups, pans, tilts, etc. – the gimbals give us the flexibility to move the camera exactly where we want to capture the scene. We use two types of SDG: A three-axis version carried on a harness for all-day, all motion flexibility, and a three-axis “hand-held” version that is compact enough to be carried in a backpack, especially useful for travel & tourism production. There is no better way to deliver the full impact of scope and scale – indoors or outdoors – than with a professional video drone. 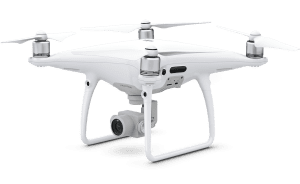 These exceptional gadgets give you that awe-inspiring “birds-eye view” in 4K, hovering in position, or moving at over 70 kilometers per hour with a range of 7km. With a host of customizable features and intelligent flight modes, a pro video drone will deliver jaw-dropping footage. Gone are the days of being jostled on forklift platforms, or half- hanging out of helicopters on a harness. Birds-eye view while traveling over forest, mountains, villages, beaches, or indoor over a large factory floor. Pushing in/ following a worker on a factory floor. Reveal shot: Have an interesting object or environment in front of the drone. Rise the drone to reveal what is behind the object. Slow rotation at elevation around a focal point. Whether it’s an industrial hi-tech video project, tourism or destination travel piece, or simply an explainer or a product video, the ‘point and shoot’ approach should never be your primary option. A seasoned camera operator will have every shot planned out, how to move from a to z before the record button is ever pressed on the camera, so there always be a beginning, middle, and an end to every shot, and each of these sections can be used separately or combined together to help create a cohesive, smoothly flowing video production. Contact us if you’re thinking about adding more aesthetic energy to your upcoming videos. 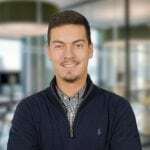 A graduate of the prestigious Humber BRTV and Bell Media programs, Matt’s has amazing audiovisual senses to capture compelling motion and sound under the most challenging conditions.